Special Containment Procedures: SCP-837 is to be contained in a clear terrarium in an airtight holding chamber. The chamber must have separate ventilation and cooling systems containing pressure release valves. Food and water are to be replaced daily while SCP-837 is active. Personnel entering the room must be trained and equipped with an ADS 2000 atmospheric diving suit modified by Foundation engineers to be lighter on land. If the atmospheric pressure of the containment cell reaches 45 Bar while personnel are in the containment cell, equalization of the airlock is to be achieved as soon as possible and the personnel are to enter and seal the airlock immediately. 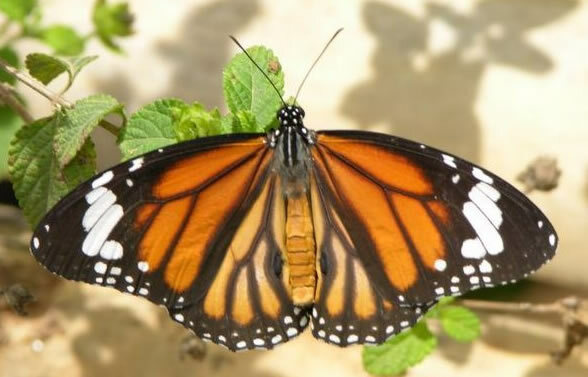 Description: SCP-837 is a Danaus genutia butterfly. Upon recovery near the south-east coast of Asia, the butterfly was fully grown. When SCP-837 flaps its wings it creates a sudden increase in atmospheric pressure around it. This pressure change has been measured as being approximately 500 pa within the SCP's 10x10x8 containment cell. The increase in pressure engendered by the butterfly causes a progressive increase in temperature in the chamber, requiring flushing of the atmospheric system to maintain cooling. Addendum: 837-1 Upon initial recovery, SCP-837 was contained in a room attached to the normal ventilation system. When SCP-837 flew inside its terrarium for prolonged periods, storms formed outside the facility due to the increase in atmospheric pressure. Containment procedures have been changed to prevent this in the future. Addendum: 837-2 SCP-837 has been found to have a self-renewing life cycle. When it reaches the end of its life span (which is significantly longer than a normal specimen of Danaus genutia) SCP-837 sheds its wings and shell, emerging as a caterpillar. SCP-837 constructs a cocoon in approximately 15 minutes. It remains in the cocoon for 129 days and emerges with an identical color pattern on its body and wings. It retains butterfly form for 78 days. Since recovery, it has gone through this cycle ██ times. On █/██/████, the pressure release valves in the ventilation system malfunctioned, preventing the heat and pressure created by SCP-837 from being drawn out of the system. At ██:██:██, the containment cell reached 573 Kelvin, killing SCP-837.